Property plant equipment (also called “fixed assets”) form part of a business’ assets. 2.	controlled in order to produce value. For more about assets, go to Assets. Property plant and equipment (thereafter referred to as “PPE”) are owned/held for the long term – more than a year. These are usually large items such as real property – buildings, factories, land developments – or vehicles, equipment and plant and machinery. Over time, most property plant equipment lose their ability to provide services. Equipment or machinery could suffer wear and tear due to use, and buildings or motor vehicles could suffer from exposure to the weather. Or equipment or machinery could be of an older model, is now obsolete and cannot be used to its full capacity/potential. To reflect this loss of ability to perform, an expense called depreciation is recorded. Depreciation reduces the value of a property plant equipment over time. The expected useful life of a PPE, usually measured in years, is estimated at the time the asset is placed into service. The residual value of a PPE at the end of its useful life, the value of the PPE after it has been fully depreciated, is also estimated at the time the asset is placed into service. Accumulated depreciation is the total amount of depreciation charged up to a certain point in time. 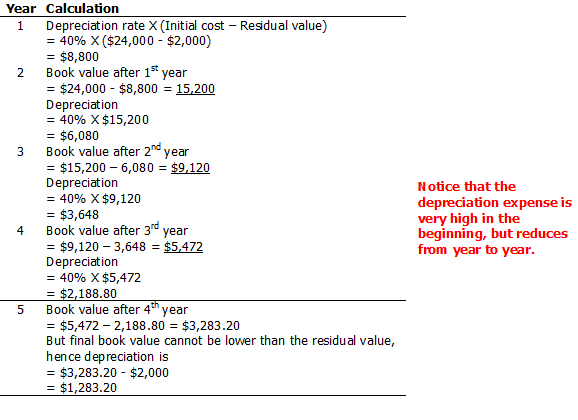 So how is depreciation calculated? Annual depreciation = (24,000 – 2,000)/5 years = $4,400 per year. Another method is the reducing balance method, which charges depreciation every year by a fixed percentage on the remaining book value (cost minus accumulated depreciation). Sometimes, depreciation estimates may change. The useful life may change – the property, plant and equipment may be used for longer than what was originally estimated. The residual value may change – the value may be more or less than initially estimated. A machine is purchased on 1 January 2011, for $140,000. During 2013, the company estimates that the machine’s remaining useful life is 8 years (instead of 3 years) and that its residual value is $8,000 (instead of $10,000). Sometimes PPE may need to be discarded/thrown away when they are not used anymore. At this stage, we need to remove their existence from the accounting records. Equipment acquired at a cost of $25,000 is fully depreciated at 31 December 2011. On 14 February 2012, the equipment is discarded (thrown away). Property plant equipment – Equipment would show a debit balance of $25,000. Accumulated depreciation – Equipment would show a credit balance of $25,000. Equipment costing $6,000, with no residual value, is depreciated at an annual straight-line rate of 10%. After the 31 December 2011, Accumulated Depreciation—Equipment has a $4,750 balance. On 24 March 2012, the asset is removed from service and discarded. Note that the equipment has not been fully depreciated as at 31 December 2011. Hence, we need to further depreciate it up to the date of the write-off, as follows: $600 X 3/12 = $150. The new accumulated depreciation balance as at 24 March 2012 is: $4,750 + $150 = $4,900. Note that the final difference between the cost of the equipment and accumulated depreciation is treated as an expense – a loss on equipment write-off. Equipment was purchased at a cost of $10,000. It had no estimated residual value and was depreciated at a straight-line rate of 10%. The equipment is sold for cash of $1,000 on October 12 of the 8th year of its use. The balance of the accumulated depreciation account as of the preceding December 31 is $7,000. Annual depreciation = $10,000 X 10% = $1,000. This brings the accumulated depreciation balance (12 October) to: $7,000 + $750 = $7,750. Let’s say the cash proceeds from the sale are $3,000. Notice that in the first case, the sales proceeds were less than the book value, while in the second case the sales proceeds exceeded the book value. Return to Accounting Terms from Property Plant Equipment.